This past weekend looked like it was going to be nice, so spur of the moment I decided to jam a weekend trip away, in between my two work trips to Lisbon. I was in Lisbon Wednesday-Friday and was scheduled to head back there next Thursday. For the last few years I’ve had a very strong desire to see the Canadian World War I War Memorial at Vimy Ridge. I’m not sure why, whether as I've grown older my sense of appreciation for the sacrifices made by our veterans has grown, but my desire to see that place for myself has grown ever stronger. Vimy is pretty close to the north coast of France where the ferries from England come in, and I decided to spend this past weekend in northern France, with the primary objective to see Vimy. I booked a hotel in Lille, a fair sized city about an hour from where Vimy is, and headed out late Friday night. The drive from the office to Dover was a fair bit longer than I expected, and took a little more than two hours total to get to the ferries. Now, living in Vancouver you get pretty used to dealing with ferries, but let me tell you, Dover is in another scale from what any of the Vancouver ferry terminals are. The place is huge – there must be close to a dozen ferry births, and these are big boats – the one I was on had 7 decks. I didn’t know what to expect, and really was hoping that I wasn’t going to show up and be turned away. Fortunately, driving up and buying a ticket worked, and it was only half an hour before the ferry boarded. Taking a right-hand drive car from the UK into France turned out to be more complicated than I thought. They have this whole big checklist that included a “GB” decal for the back of the car; headlight deflectors to prevent the headlights from blinding oncoming traffic; reflective vests for all passengers (?!?!? ), first aid kits and the like. I had to buy some of them, just to be legal to drive. Very strange. After taking care of all that, it was time to board the ferry. Nothing unusual there, it was all pretty straight-forward. The ship itself was very cool – big, as I mentioned – it had a full food court, duty free shop commercial drivers lounge and restaurant and at least three bars that I counted. It was pretty late, so everything was pretty quiet. The trip passed pretty fast; about an hour and a half I think, and we were in France. After arriving and disembarking from the ferry I still had about an hour’s drive to Lille. I managed to get there without getting too lost, and it was pushing 2 a.m. by the time I got checked into the hotel. In my travels I’ve had the opportunity to drive both left and right-hand drive vehicles, but this was my first time driving a right-hand drive car on the left side of the road. And it is by far the hardest thing to do, and took quite a while to get used to. Not sure that I like it really. Saturday morning brought a beautiful, sunny day, which brought my spirits up for the day. The weather in the UK had been so bad this summer that a weekend this nice seemed like it wasn’t for real. 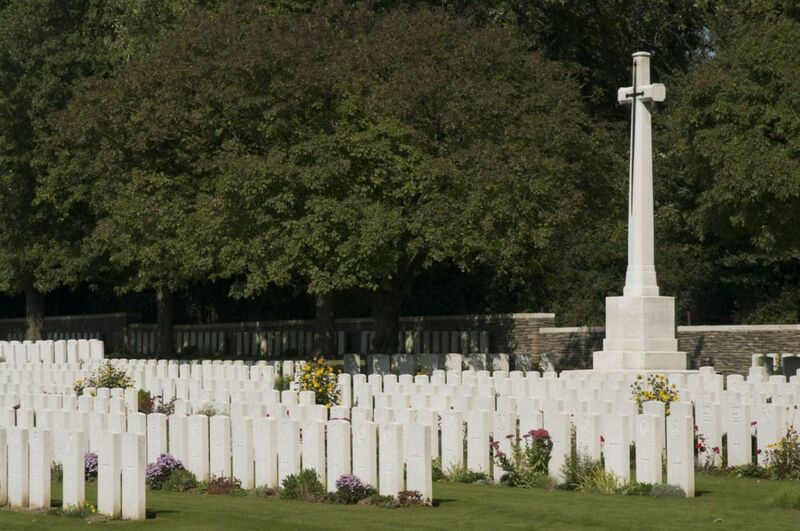 The site at Vimy is close to the town of Arras, about an hour southwest of Lille. I was up and at it pretty quickly, considering the night before. By 10:00 I was on the road, and by 11:00 was at the Vimy site. The Canadian Memorial at Vimy Ridge. For those that are not familiar with the story of Vimy Ridge, you can find a better description here, than I can ever give justice to, but the short story is that in 1914 the Germans had taken Vimy Ridge, a strategic high point. A number of allied forces had spent all their time just holding the Allied position near Vimy. In 1916, the Canadian forces planned an assault on the German position. It was the first time all four Canadian divisions had acted together, and it was one of the most impressive (and innovative) maneuvers of the War. The Canadians took the Ridge over the course of three days and never surrendered it. It has been described as the true birth of our nation; the time and place where Canada placed ourselves on the world stage and were recognized as a nation, and more than just a piece of the Commonwealth. Names on the Canadian Memorial at Vimy Ridge. You come at the Monument from the south, along small country lanes that weave through a park just outside the grounds of the Monument. The area surrounding the Monument still contains the remnants of the trench system that was built to attack the Ridge. This includes some impressive craters from under-ground explosions, the surface trenches and the underground tunnel systems that were built for communications, and to move men and equipment closer to the front. The area now looks quite beautiful, a far cry from the devastated mud-filled plain that existed during the war. The trenches are now all covered in grass, sheep graze over the area (despite the numerous signs forbidding people to enter, due to unexploded munitions in the area…), and a large number of trees that are now a good size. All-in-all, the area is idyllic and very peaceful. The Monument appears out of the trees, a huge, white structure perched on the crest of the Ridge, rising over the small grassy plain, gleaming in the bright autumn sunshine. 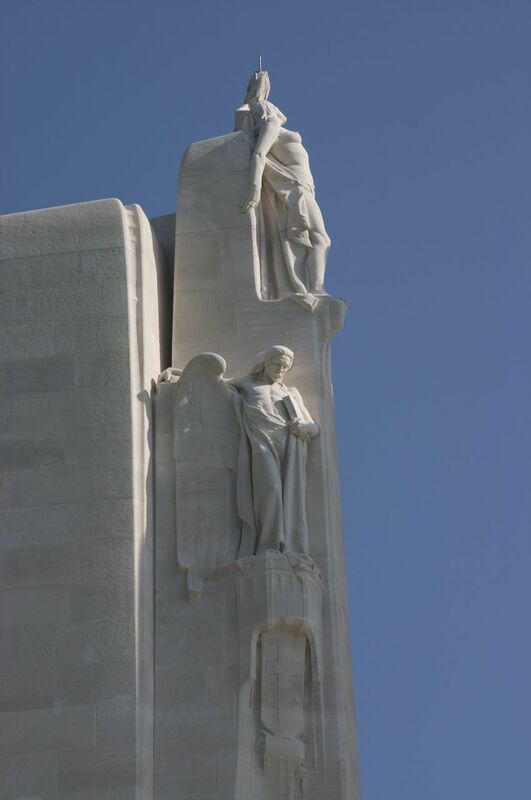 The site is actually sovereign Canadian territory, given “in perpetuity, from the people of France to the people of Canada”, in recognition of the events at Vimy. The approach to the site from the car park, walking across the grassy area gives you plenty of time to take in the Monument. It looms large over the surroundings, but you don’t get a sense of the true scale of it until you’re much closer to it. As it was still relatively early, and off prime tourist season, I almost had the place to myself, which I really appreciated. The Monument is truly an amazing work of art – two huge columns thrusting up into the air, covered in beautiful sculptures. On the side of the Monument that you initially approach, a series of stairs leads up to the base of the columns. Two reclining figures adorn the stairs, and a low wall surrounds the base of the Monument. The wall is etched with the names of the 10,000+ men who gave their lives, and whose bodies were never found. At the top of the stairs, the following words are inscribed into the base of one column: “To the valour of their country men in the great war and in memory of their sixty thousand dead this monument is raised by the people of Canada”. As you move around to the front of the Monument, you start to get a better understanding of the strategic position, as the view over the surrounding area is breath-taking. At the front is a lone figure of a woman, head bowed, looking out from the Monument over the fields of France. I spent a long time walking around the Monument, taking it all in, and moved in ways that I have never experienced previously. I’m doing a poor job of describing the beauty and power of this place; standing there in the shadow of this testimonial to the Canadian spirit; running your fingers over the names of the men that gave their lives, I was moved to tears. It was unexpected frankly, but a testament to the incredible job that was done in designing and building this amazing place. It made me very proud to be Canadian, and connected to these important events. I’m not sure how long I spent at the Monument, but it was quite a while. Finally I tore myself away from it, and walked down to see the visitor centre. The centre has a nice little display of artifacts from the area, and small displays on the things the soldiers in World War I had to deal with. It’s not big, but nicely done. Outside the visitor centre there are a series of short walks that you can do that lead to a number of reconstructed trenches so you could get a feel for them. There are also guided tours of some of the underground tunnels. It was just after lunch time, and the next tour that had availability was at 2:30, so I had some time to wander around some more. I strolled away from the visitor centre, up one of the roads to see a couple of the Canadian Cemeteries. The main cemetery is a beautiful, peaceful place. 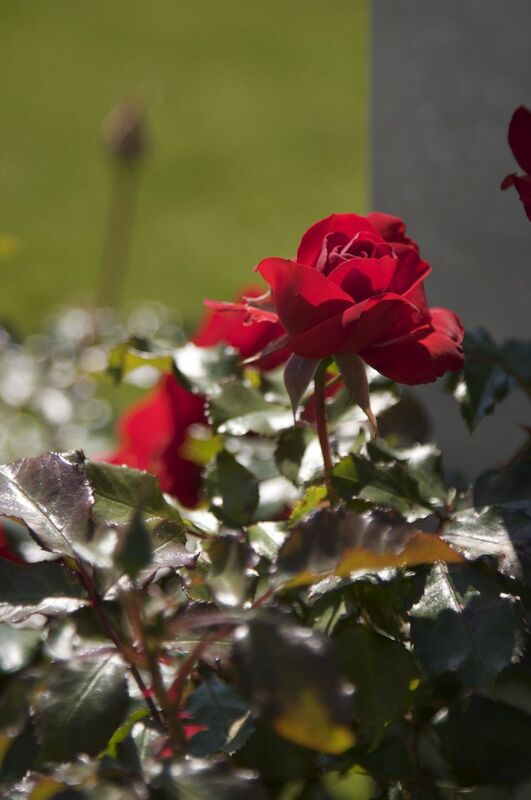 The French have done an amazing job in maintaining the cemetery – it’s impeccably maintained, the grass perfectly cut and trimmed around all the graves and flowers blooming everywhere. And sadly, the place is really quite large. It hits the point home hard that a whole generation of Canadians went overseas, and never cam e home. 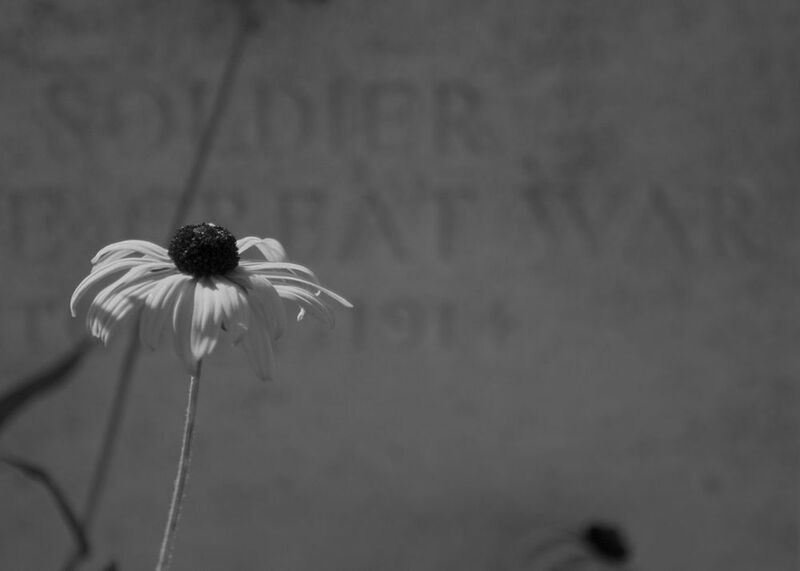 You look at the tombstones – 18, 19, 22, 23, 25 – you forget how young most of them were. 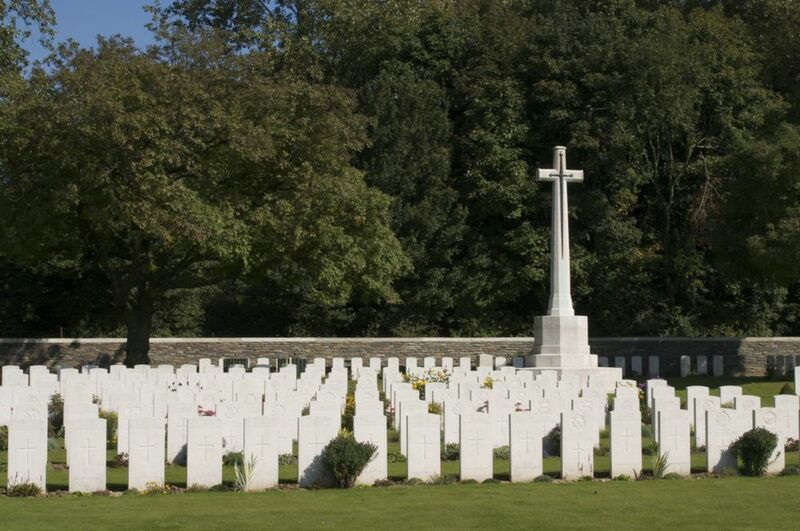 It was another moving, emotional visit, seeing these long rows of white tombstones, gleaming in the sunshine, stark in contrast to the green grass. I’m not sure how long I spent there, but it must have been quite a while. I didn’t have to wait long for the tour to start, once I got back to the visitor centre. The tour of the tunnels was pretty cool, and well worth seeing. These tunnels were about eight metres below the surface, but there were others that went down to an astounding 30 metres – that’s a long way underground. The area surrounding Vimy is mostly chalk, and so the tunnels are carved through this very interesting chalky soil – you could break off little pieces and write with it – kind of cool. The guide (all of them are Canadians) took us through a series of tunnels and rooms, showing us where the men would have slept, the communications and operations rooms and a number of other interesting areas. It wasn’t a long tour, but it was very informative and frankly quite interesting. By the time the tour was done, I walked back to the car park near the Memorial (had another short look), and headed out, it was starting to push into late afternoon. I drove into the town of Arras, about 10 miles from Vimy. 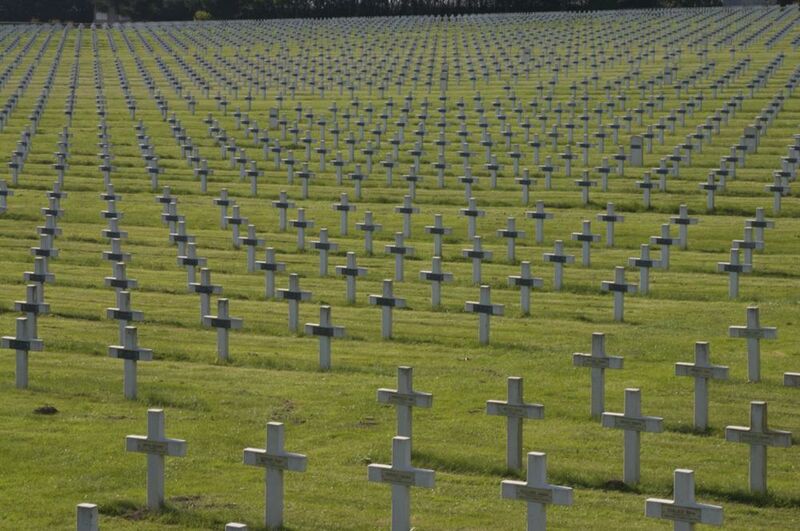 Along the way I passed a number of French and British WWI cemeteries – long, long rows of white stone crosses in a sea of green. I stopped at one, the size of it was unbelievable, and again, you get a real sense of the loss. You still get a sense, as you drive the countryside that there’s an appreciation for the sacrifices other countries made in liberating France. Little things like “Canada Way” in a small village or the amazing shape that the War Cemeteries are kept in. This may quickly be becoming ancient history, but it isn’t forgotten here. I think perhaps back home we don’t honor the memory as strongly as we once did, which isn’t right. Arras was interesting – you get the impression that it’s a very old town. And it is, but it was pretty much completely rebuilt after the war, judging from the pictures in the main town hall. The whole of the Grand Place was rubble, by the look of these photos. They’ve done a nice job re-creating the look of the original, and I’m sure they were able to save some of it. There are some nice churches and interesting buildings in the town, and as it was such a nice afternoon, all the cafes and bars with patios were packed. I wandered around for a while, had something to eat, and called it a day. The drive back to Lille was pretty uneventful. Some of the old buildings in Arras. That evening, I wandered around Lille for a bit, just checking it out. I didn’t get a chance to see much of it in daylight, but Lille seems pretty cool. Given that it’s a Eurostar stop, I may try to go back for another look around. Sunday was pretty uneventful. Knowing it was going to be a pretty long haul back, I started early. It did give me a chance to wander around Calais a little bit. Calais seemed like it might be interesting – if everything wasn’t closed. I guess in some parts of France, Sunday still is a day of rest. Not very helpful really. I wandered for a bit and checked out the very elaborate town square and some of the gardens. The ferry ride back was a lot busier than the one over. The trip gives you a pretty good sense for how busy a shipping lane the English Channel is. There were a good half dozen ferries, along with numerous freighters and pleasure craft. The last part of the trip took us along side the White Cliffs at Dover, which was cool to see. They were gleaming in the bright sunshine. It was a good weekend. Vimy was amazing to see; I’m really glad I went, as the memories of that place will stay with me for a long time. I really lucked out with the weather, considering how things have been the past few month. That gave me a nice opportunity to see some of northern France, the English Channel (from ocean-level), the White Cliffs and a couple of cool old cities.